VX-6's LC-130 aircraft first made it to the ice (and to Pole) in the 1960-61 season. Juliet Delta 321 was the first of these to arrive. 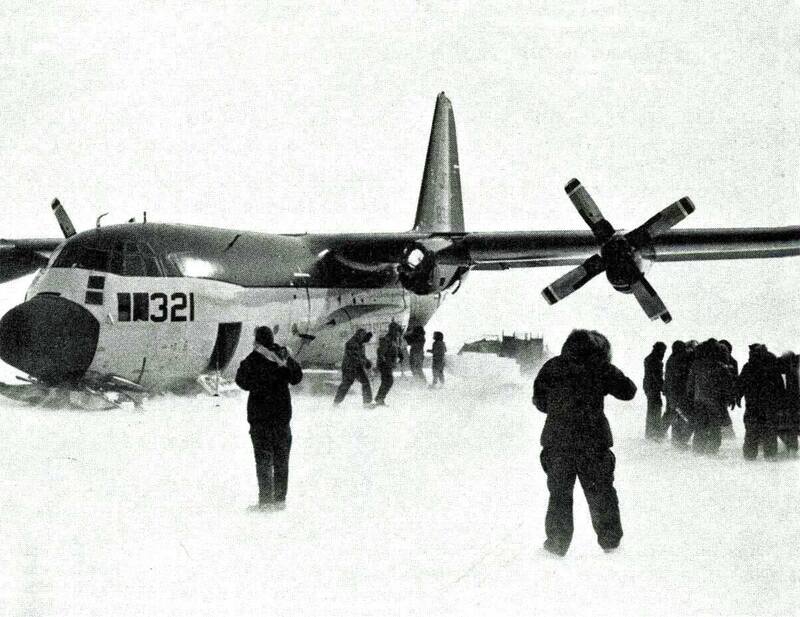 This photo shows 321 in front of 319 on the ice runway in November 1960 (photo courtesy PK Swartz, the DF-61 Pole OIC, who took this picture just before his flight to Pole). 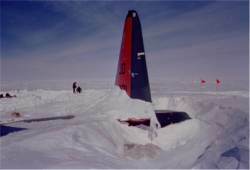 On 4 December 1971, the LC-130 aircraft Juliet Delta 321, piloted by LCDR Ed Gabriel, was damaged during takeoff from this site ("D59") 125 miles south of the French station Dumont d'Urville and about 850 miles from McMurdo Station. 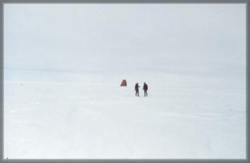 It had just completed the second of five supply flights to the French Carrefour traverse party, part of a U.S./French glaciology project. The traverse was on its way to the Soviet station Vostok from Dumont d'Urville. After an uneventful open field landing and resupply, during the takeoff at an altitude of about 50 feet, two JATO bottles (165-pound solid-fuel rocket bottles used for "jet assisted take off" from soft open-field landing sites) broke loose from their attachment points on the left rear fuselage. One went up the tailpipe of the #2 (inboard left side) engine; the other struck the #2 propeller. The propeller went to pieces, and some of the flying debris took out the #1 engine and propeller, with several large pieces entering the cargo compartment. 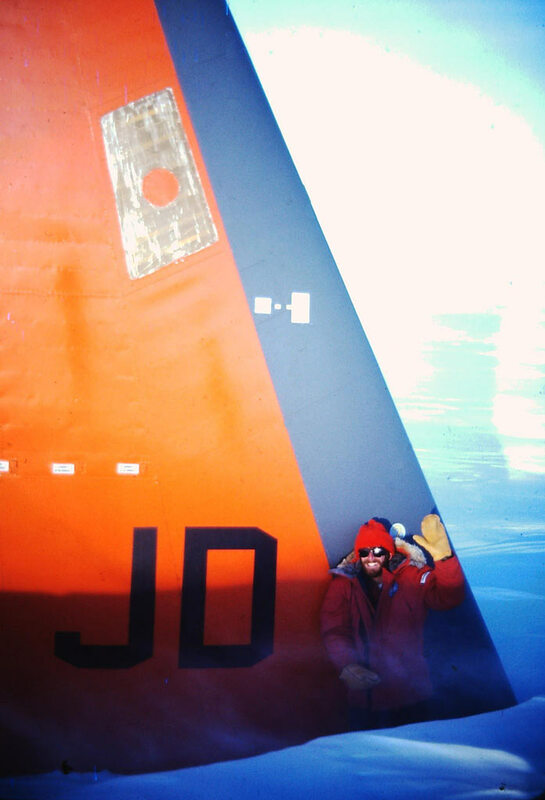 Above left is a photo from Ralph Lewis taken during the rescue; above right is a U. S. Navy photo taken just after the crash (AJ 9/79; when this photo was published there had been plans to recover the aircraft during the 1980-81 season). Since they had just gotten airborne, the sudden loss of power from engines 1 and 2 with 3 and 4 still at maximum power caused the plane to yaw hard left with the right wing coming up rapidly. Ed rolled the aileron full right wing down, applied full right rudder, and closed the throttles. 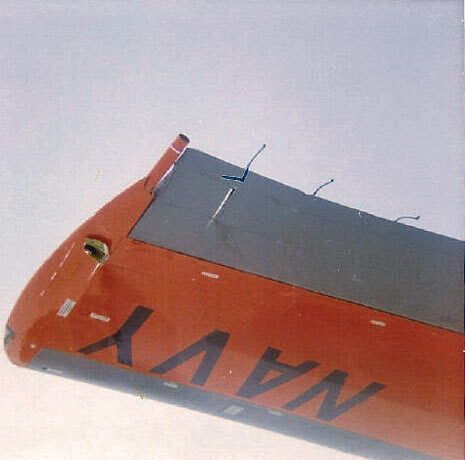 He managed to get the plane straight and level just prior to the impact (which collapsed the nose ski. 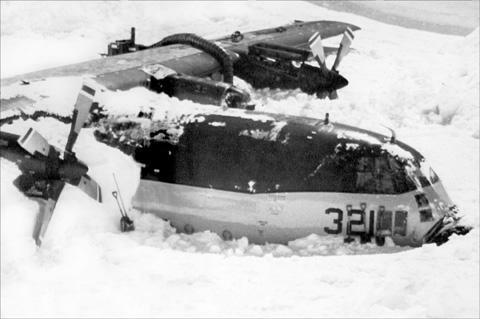 He resisted any urge to power the plane out of the problem, otherwise they would have struck the snow in an extremely left wing down attitude and the aircraft would have cartwheeled itself to pieces, with loss of life. 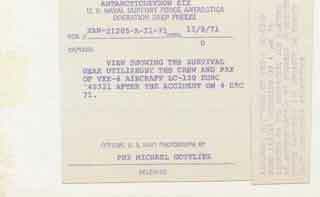 The pilot was awarded an Air Medal for his amazing presence of mind. 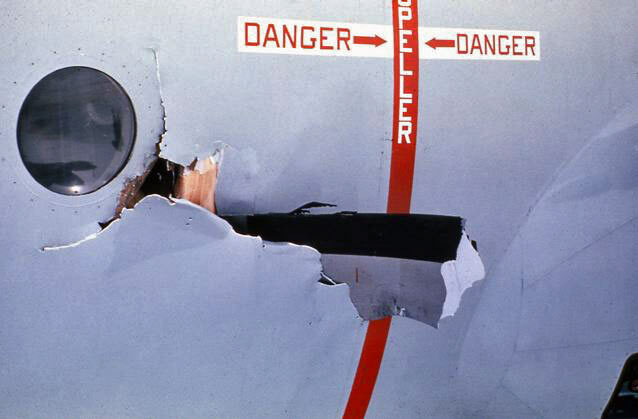 The photo at right (Ralph Lewis) taken just after the crash shows the JATO mounts on the left side of the aircraft, with the burn marks from the bottles that broke free. Besides pilot LCDR Gabriel, some others in the 8-man crew were LTJG Bob Schmucke (copilot), LT Billy Bounds (1st navigator), ENS Brian Paul (2nd navigator), AE1 Virgil Harris (flight engineer), AT3 Tom Gregg (flight avionics tech), and ABH1 Glenn Schellenberger (loadmaster). There also were two passengers on board. 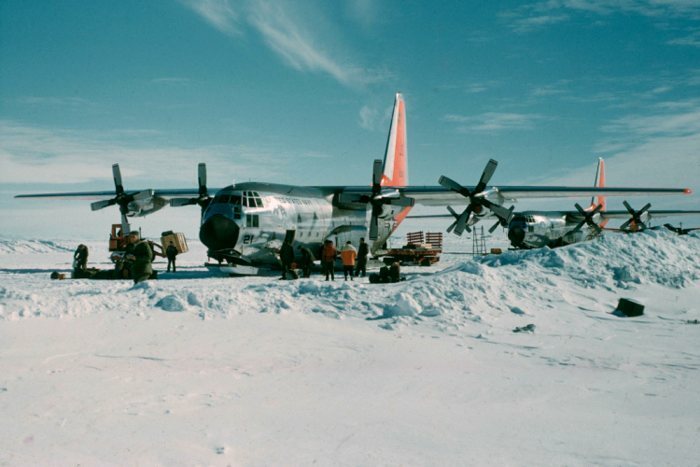 No one was injured, but the 10 men had to live in survival shelters for more than 3 days until the weather improved (left, the survival camp behind the aircraft--Lennie Bourgeois; right, a view of the aircraft from behind the camp--Ralph Lewis). 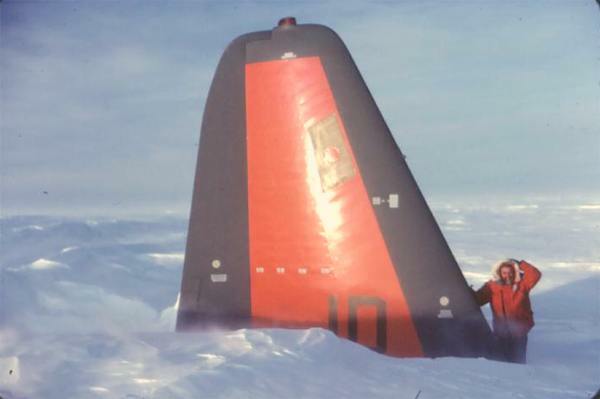 Tom Gregg shared with me his tale of the crash, which I'll add here: "About midway through my second year we were called on to resupply a French expedition that was driving across Antarctica. They had modified Sno-cats which were each pulling a flatbed trailer on tracks. 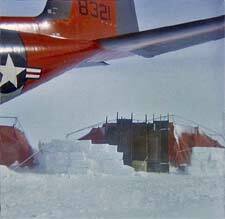 The trailers carried all their supplies, two of which were full of 55 gal barrels of fuel. They had to be re-supplied at the mid point of the journey. 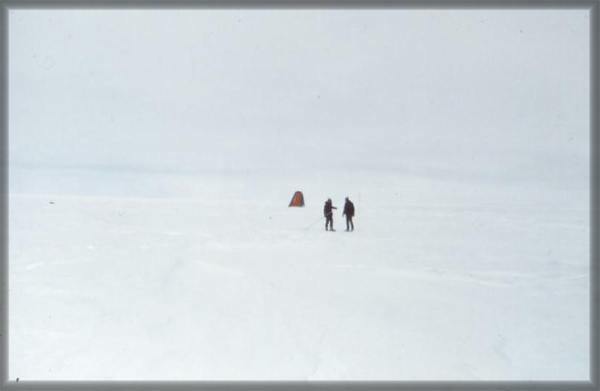 That mid point was out in the middle of nowhere about 800 miles from McMurdo. So we load up pallets full of gas and other items and head out. I forgot to mention, our C-130's are ski equipped, obviously, which allowed us to land anywhere since most of Antarctica is frozen snow and ice. 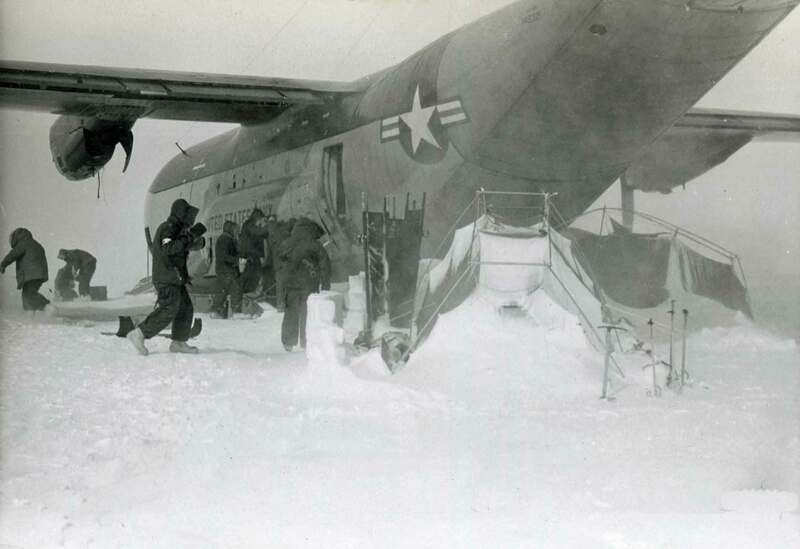 Of course it's not always "smooth" snow, and many times was rippled by the wind which made for an interesting landing across 2 ft high washboards. 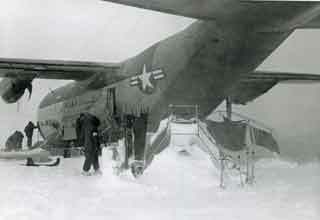 The main skis on the planes were 4' wide and 28' long with teflon coating on the bottom for low friction. 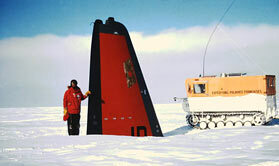 The nose ski was the same but only about 3' wide and 6' long. "So off we go to find the French. Now the added bonus. 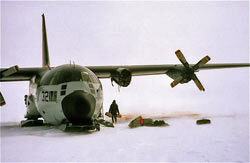 The C-130 was designed as a transport aircraft capable of carrying heavy payloads. 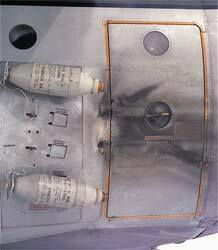 But, in the event that it needed extra boost, they built racks on the side of the plane for mounting JATO bottles. JATO stands for "jet assisted take-off". They are basically solid fueled rockets that produce about 1000 lbs of thrust each. 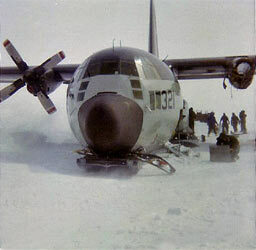 The Pratt and Whitney turbo prop engines on a C-130 produce about 4600 lb of thrust each, and there are four. The racks for the JATO bottles hold 4 bottles on each side of the plane. So, we have this old stock of JATO bottles stored at the base in McMurdo just in case the snow ever thaws to the point that we might need extra lift getting off the ground. They have never been used in years, but what a perfect opportunity to test them to see if they're any good since we're headed out to the boonies and who could get hurt. Uh Oh. So, we take 8 of them with us. "Now we find the French, unload all their stuff. Time to mount up the JATO bottles for the big test. I need to inject another side note. 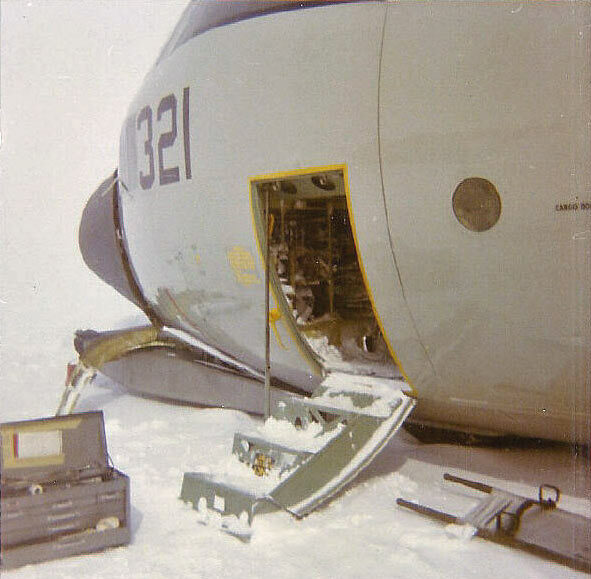 "After losing all my 35mm camera gear the first year [he had been aboard LC-130 #318 when it crashed upon takeoff from Williams Field on 15 February 1971], I decide during the second year to buy 8mm movie equipment, which I have with me on the trip. So, we're attaching the JATO bottle to the racks and getting ready to leave. I have this all on film. Since we don't really need the JATO assist for take off we decide to wait until we're in the air to fire them. Right behind the JATO racks on the outside of the plane is the rear crew door with about a 12" diameter window in it. I have never seen JATO bottles ignite so I decide it would be cool to stand at that door and watch them light off. As I said in my last email, the door is on a track that goes up and down. When you open the door there is a handle at the bottom of the door you use to pull the door up with. So, I'm standing on the handle and looking out the window. My real seat that I'm supposed to be strapped into during take off and landing is up by the front of the plane, and my camera is hanging on the back of that seat. "So off we go across the snow, bouncing as we go and I'm hanging onto the door. Up in the air we go and I hear the pilot say he's ready to fire the JATO. And then, all hell breaks loose. When the bottles on the left side of the plane ignite, which is the side I'm on, two of them break free from the mounting bolts and become airborne rockets. One of them goes straight up the tailpipe of the #2 engine, the one closest to the fuselage on the left side of the plane. It goes thru the engine and knocks the propeller off the front of the engine. Part of the propeller comes through the side of the plane, cuts my assigned seat in half along with my camera hanging there, and proceeds across the plane into the electronics bays. The remainder of that propeller goes over and takes the prop off the #1 engine, the outboard engine. The second JATO bottle passes us and then turns and heads right back at us but misses. Now here's the exciting part for me, as if that wasn't enough. Before one of the bottles take off it detaches off the front latch, but remains attached at the rear, so it pivots on the rear mount and is now pointed directly at the door I'm now firmly attached to with a death grip. It has enough force to push the door into the fuselage but not break the tracks off the wall. So now I'm attached to a door that's surrounded in a ring of fire. I guess it was a Johnny Cash kind of moment. 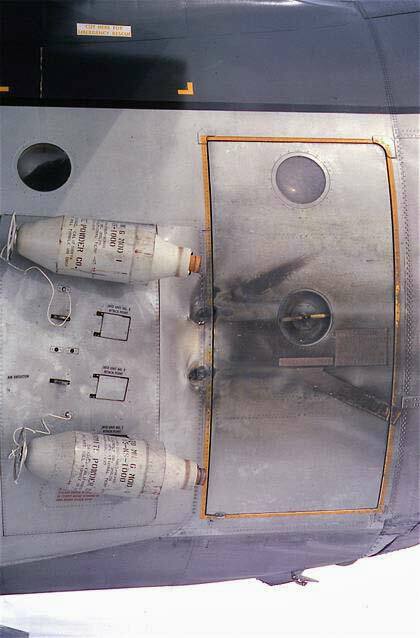 O.K.remember we are still in the air at this point, but we no longer have any engine power on the left side of the plane and only one JATO bottle pointing forward. On the right side of the plane we have two Pratt & Whitneys pumping out a combined 9000 lbs of thrust, accompanied by four JATO bottles with an additional 4000 lbs of thrust. It works like those pinwheels you light off on the 4th of July and they start spinning like crazy. Airplanes do the same thing. So now our horizontal flight has turned into this left wing down kind of vertical flight. Not so good. The pilot attempts to correct as much as possible but the left wing hits the ground first and the next impact is the nose landing gear. 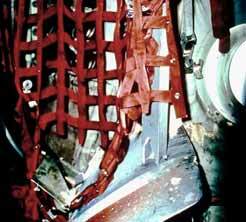 The hydraulic cylinders of the landing gear come up through the center console between the pilot and co-pilot and we finally come to a screeching halt, and that's a good thing. No fires, and no one dead, except for my movie camera and a multi-million dollar aircraft. I forgot to mention earlier. JATO bottles, being solid fuel, don't have an on/off switch. They light and keep burning til there's no fuel left in them. "O.K., all is well except for one thing. Now we are 800 miles from base. 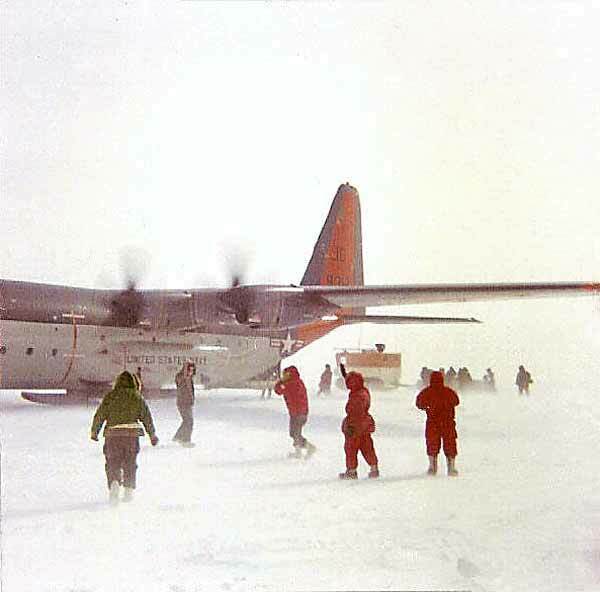 Our aircraft radios are still working so the folks back at McMurdo know the situation and immediately dispatch a second plane to rescue us. But, before they get to us a hawk comes up. Now the rescue plane has to turn back since they couldn't land if they found us. That hawk raged for 4 days. But the good news is our plane has survival gear just for this purpose. We have tents, sleeping bags, Coleman stoves and fuel, bouillon cubes of food, etc. enough for 17 people. Try setting up a tent in 60 and 70 mph winds sometime. 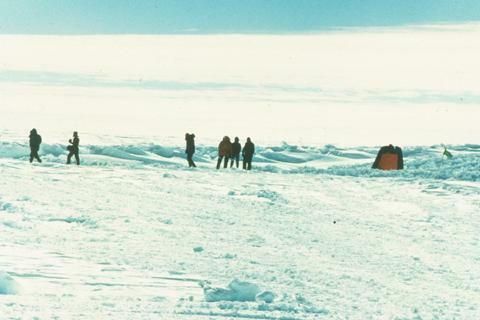 We first had to pull some of the cots that are in the plane out to make a wind break, then set up the tents, and then get all the stuff inside. Keep in mind that the wind chill is now minus 100 deg outside. A bit nippy as they would say in New Mexico. 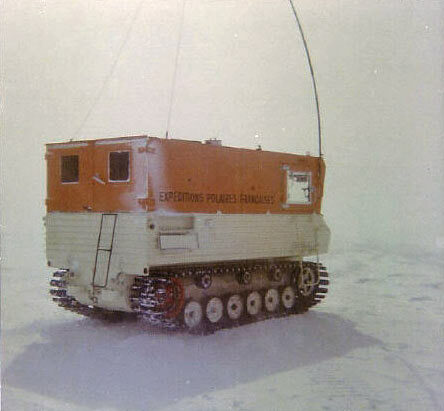 If you ask why we didn't stay in the plane, here's the first rule of arctic survival. Never be around anything metal cause metal is a cold magnet. That's why your car always seems colder than the outside air. So we're all snuggled in our tents, which we only used two, and we have the entrances pointing at each other so we can combine resources. We have put as many sleeping bags inside of one another for each of us as was allowed by the supply on hand. It's time to get some heat going on the stove. Well guess what. At anything past -60 deg. the gas will not come out of the valve on a propane bottle. So here's the scary solution. You hold a match under the valve on the top of the bottle to keep it thawed out so the gas will flow and light the stove. Then you boil water while doing that match thing. Then you use the hot water in place of the match while you boil more water. Repeat as necessary for hundreds of hours. Well, they finally came and got us and the plane remained there for many many years. I'll enclose a pic of what it looked like a few years ago that I pulled off the web [some of the other photos seen on this page--Bill]. Here's why I was able to find that pic. 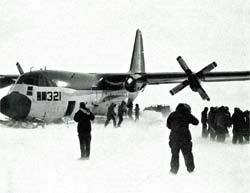 I was watching the Today show several years ago and they had a story from CNN about a plane being restored in Antarctica and the subsequent crash of a plane ferrying folks out to do the restoration. I believe 9 people were killed in that crash. I'll try to find the article and send it to you. The reason they were trying to resuscitate the plane was that in an uncharacteristic move, our government was trying to save money. 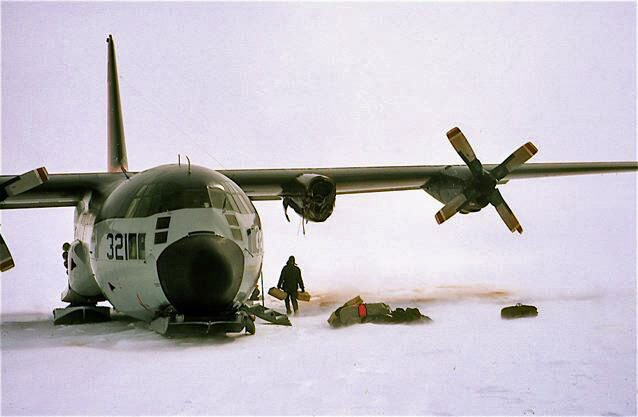 They needed more planes for use in Antarctica and the cost of a new C130 was about $300mil. Some rocket scientist figured they could restore my plane and fly it out for less than $50mil. They did end up getting it out, but killed 9 people doing it. That had to be a monumental task, cause I know all the damage that needed to be repaired. Every rivet holding the nose on the plane was broken loose when we crashed. Also, when they came and rescued us I was told to salvage any electronic equipment possible. I didn't unplug anything because there wasn't time. I cut the wiring at all the connections to the nav and radio equipment and took it with us. I can't image how much work it took to rewire all that. Anyway, when the propeller cut my camera in half, it actually knocked the 8mm film cartridge out of the camera and it stayed intact. When I saw that article from CNN I called their headquarters and told them I had the only film of that plane before it crashed if they were interested. Apparently not so much cause I never heard from them, but I still have the movie along with all my other movies from that season. I really need to get them transferred to DVD before they are lost. I had also offered up that tape to the government investigators researching the cause of the accident. The movie shows us mounting the bottles prior to take off, but they weren't interested either. 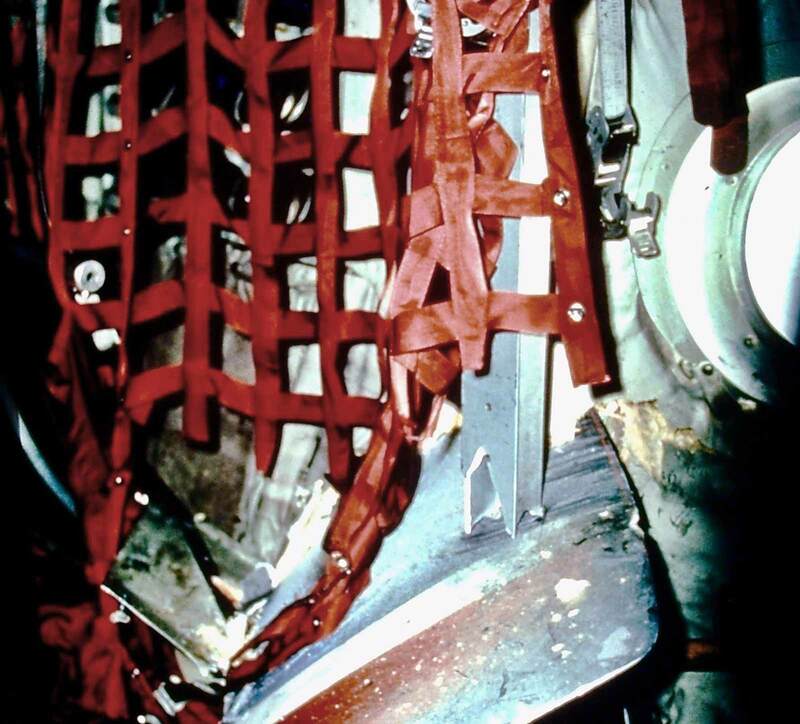 At the time they ruled that it was crew error in mounting the bottles improperly, but I read in the article on the net that they later found out the real reason. That plane had gone back to Lockheed the summer before we went down for the season. While at Lockheed they had repainted the plane. They didn't cover or tape those mounting hinges and it was the buildup of paint that caused them to not lock properly. If you look at the picture I sent, you can see our wind break of cots and the tents. If you're interested I have lots more photos I can scan and send of the propeller sticking through the side of the plane and my seat on this inside. My guardian angel was definitely present on that day and kept me out of the seat I should have been strapped to. "So Bill.......I probably had the best seat in the house during the crash and I didn't even get recognition as a crew member on your description of the accident." (I did add his name to my page, long before I added his amazing tale. 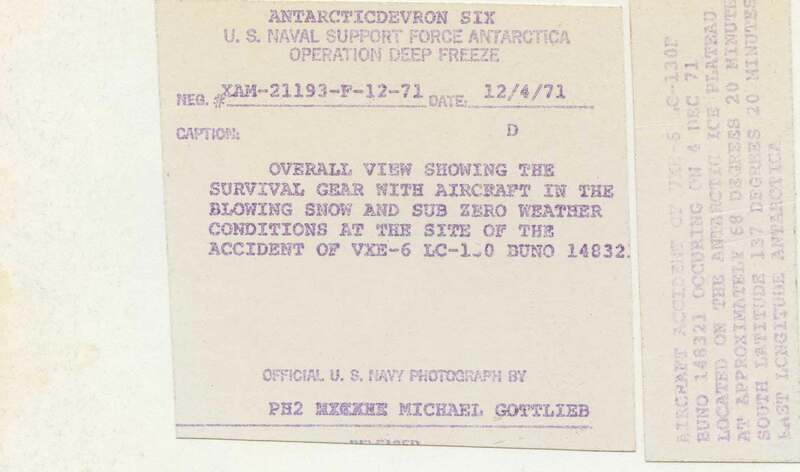 Below...two official Navy photos of the survival situation, with captions, thanks to Raymond Norwood. 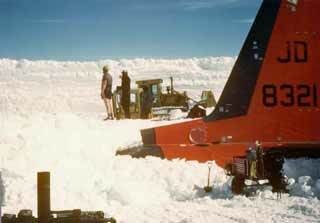 Eventually conditions improved enough to allow a rescue plane to land. 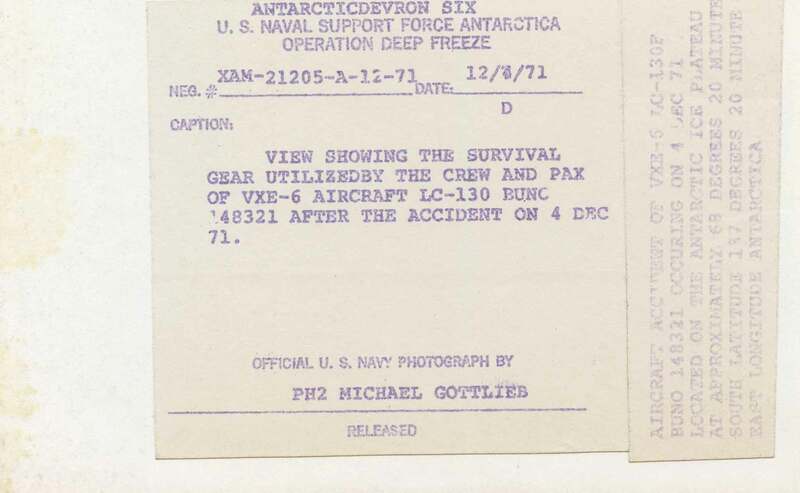 The Navy personnel who arrived to inspect the aircraft and investigate the accident determined that salvaging it would be too dangerous and costly; the salvage crew was given only an hour to cut loose the most valuable instruments (and take some of these photographs), and the aircraft was left to get buried. 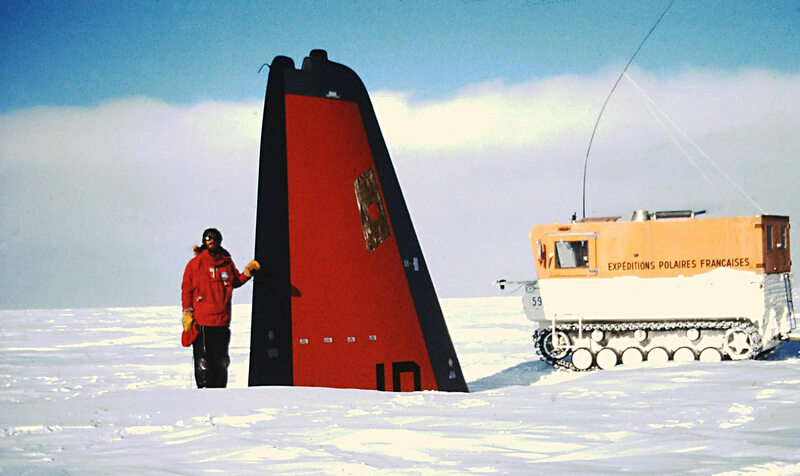 Below, a photo of folks in front of the rescue aircraft (Lennie Bourgeois). 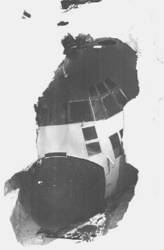 In 1977-78 VXE-6 mounted an assessment/survey mission to evaluate the feasibility of recovering 321, and the aircraft was partially excavated. At left is Richard Horton's picture of the excavation, at right is his view of the tail section. 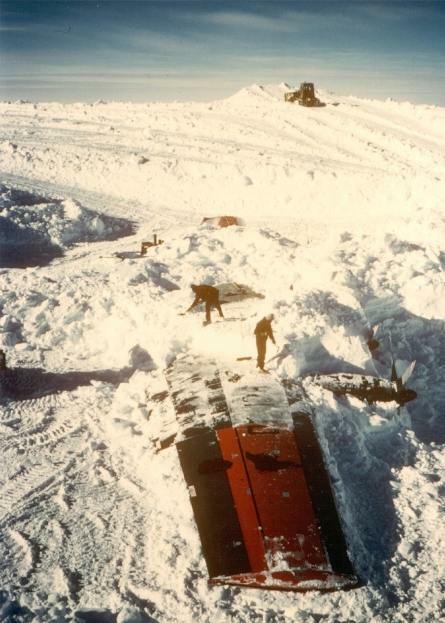 The four engineers recommended recovery, which was originally planned for the 1979-80 or 1980-81 austral summers, but budget restrictions cancelled the project. Some of the ITT/ANS crew taking a rare break. 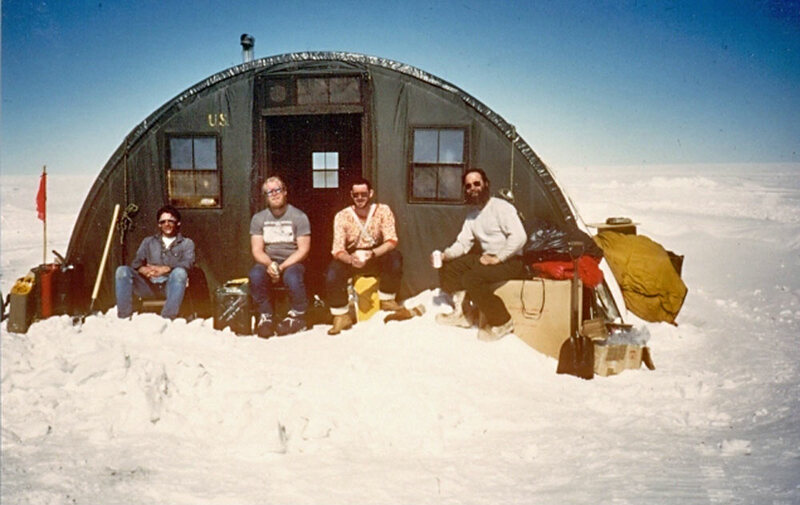 From left: Jim Mathews (project manager), Didier Simon, from Expeditions Polaires Francaises, Dan Check, heavy equipment operator, and Russ Magsig, heavy equipment mechanic. Not pictured: Roger Biery who designed the excavation pattern, cook/medic/radio operator Michael Brashears, and project engineer George Cameron (this and the next three photos are from Jim Mathews). At right, a view of the excavation in progress. The guy in shorts is equipment operator Dan Check...Jim Mathews reported that the D-6 had an excellent heater, so Dan would often work in shorts...and the excavation pit was surprisingly warm as it was sheltered from the wind. At left, digging out the wings of 321. 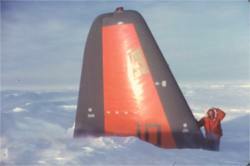 The four engines and three propellers were removed and shipped out for rehab; this salvage effort alone more than paid for the entire recovery effort. 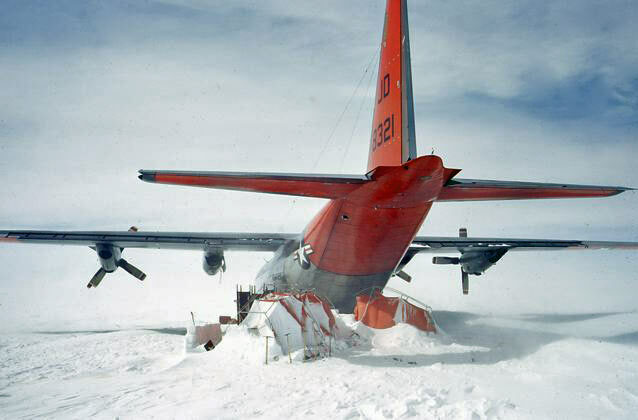 At the end of the season 321 was parked on the surface 300 feet downwind of the camp. In 1987-88 the team returned to complete the project. 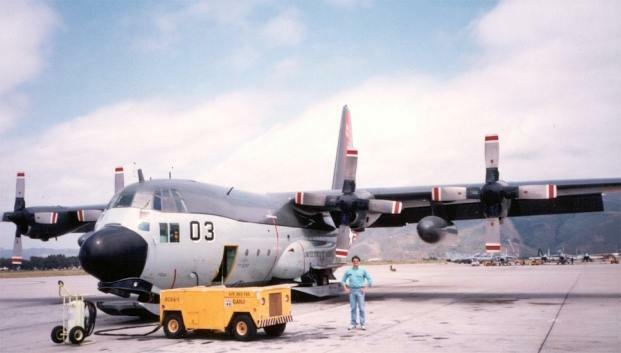 Unfortunately, before the recovery could be completed, another LC-130 (131) crashed at the recovery site on 9 December 1987, with two deaths and a total loss of the aircraft. 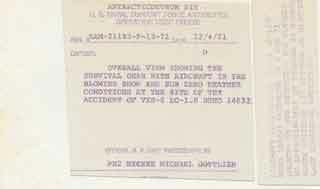 Killed were LCDR Bruce Bailey and AK2 Donald M. Beatty. Here's more information about the crash, with photos; the Antarctic Journal article about the crash is here. 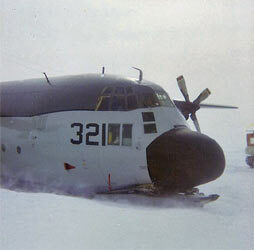 Nevertheless, the project continued to completion, and 321 flew back to McMurdo on 10 January 1988. 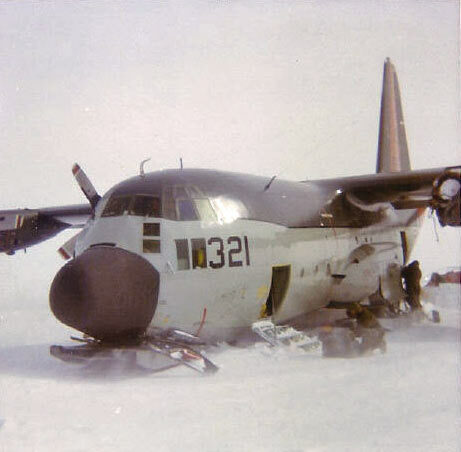 Thence it went to ChCh for further rehab, it returned to VXE-6 service a couple of years later. This is the Antarctic Journal article about this historic flight. Here's Guillaume Dargaud's page with many more photos of the crash site, subsequent visits, and recovery.